Multi-functional housing components for sensors in automobiles are the automotive segment in which the Austrian family-owned company Promotech, based in Schalchen near Mattighofen, specializes. One example is a combined rain, light and moisture sensor for motor cars. The top part of its housing with a diameter of just 33 mm incorporates seven infrared rain detectors and two lenses to measure the ambient light level. A connection plug with insertion-molded metal contacts is an additional component integrated in the housing. A vertical 3-component injection molding machine from Wittmann Battenfeld with an ultra-compact configuration of the injection aggregates is used to produce this part. Every modern car is equipped with an abundance of electronic systems to enhance both safety and comfort. Sensors are vital components of such systems. One such sensor is the rain/light/moisture sensor. Its housing consists of three different types of polycarbonate (Fig.2). Material number one is crystal-clear PC for the two lenses which measure the ambient light (to activate vehicle lighting) and the headlamp light of oncoming traffic (to control automatic dimming). Material number two is purple PC used to form six lenses positioned on the corners of a hexagon, as well as an additional central lens. These lenses support the emission and reception of infrared light rays. 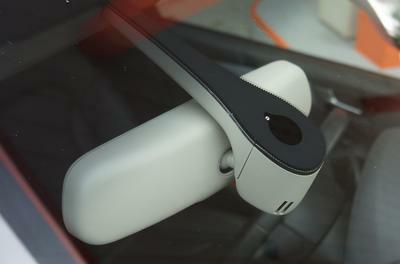 The rays are emitted by an LED lamp on one side and reflected by the boundary surface of the windshield to the receiver photodiode positioned on the other side. The infrared light ray, however, is only completely reflected as long as the windshield is dry. As soon as there are rain drops on the windshield, the reflection is disrupted, and only part of the light reaches the receiver diode. The difference in intensity compared to the degree of light reflection when the windshield is dry controls the function of the windshield wiper. The lenses are embedded in a housing made of black polycarbonate. Another integral part of the housing (with a total weight of less than five grammes) is a connector with three insert-molded male contacts (Fig.2c). The housings are also connected by means of a “flexband” to a moisture sensor, which detects moisture on the inside of the windshield and activates the blowers accordingly. A comparison of the weights of the three polycarbonate components clearly shows that the production of this 3-component part requires a combination of micro with standard injection molding. Every molded part contains 0.1 g of crystal-clear PC, 0.2 g of purple PC and 4.2 g of black PC for the housing. With the required 4-cavity production, the total shot weights of 0.4, 0.8 and 16.8 grams still remain at the lower limit of standard injection molding technology, especially at the first two injection stations. Production without sprue where possible and consequently without the necessity for recycling was also aimed at. Accordingly, the choice of the ideal injection molding technology was a real challenge for the Promotech project team, especially since insertion and insert-molding of 3 contact pins for every part had to be integrated into the injection molding process as well. Christoph Feichtenschlager, project leader at Promotech, comments: “Our many years of experience in the production of metal/plastic hybrid parts prompted us to choose a vertical machine concept. The Battenfeld solution is a machine model with the complex designation VM 100 / 210 / 60 / 60 R 752 (Fig. 3). This name stands for a machine with a vertical, fully hydraulic, 4-tie-bar, 100-ton clamping unit and a 3-station rotary table with a diameter of 752 mm and three injection units, which are also vertical, in sizes 60 (twice) and 210. The first two injection units with 14 mm screws are the smallest injection-molding aggregates with standard screws. The third aggregate is equipped with a 30 mm screw. So all project partners had to target maximum compactness from the very beginning. Partners besides Wittmann Battenfeld were Mold Masters, as manufacturers of the hot runner systems, the mold-maker KTW and the automation equipment manufacturer MKE. Implementing this project required thinking out of the box at several points, for example, by concentrating the five original production steps required to make this multi-component injection-molded part (insertion of the metal pins, injection of 3 different materials, removal of finished parts) on only 3 stations. This concentration was the only way to accommodate the 3 x 4-cavity mold system on the 752 mm rotary table. Integration of the two micro injections in one of the three rotary table stations makes it possible to use just one hot runner system for guiding both materials simultaneously on two levels via needle shut-off nozzles, each to the five injection points per cavity. Accordingly, the designers of the machine have placed the two smallest aggregates (designated as B and C in Fig.4) as close as possible to each other on the fixed platen of the machine. But in spite of all these machine and mold technology features, an additional process technology trick had to be used to ensure a safe material dwell time in the hot runners, i.e. by producing a small-volume material disk together with each part, and then transferring it to the reclaim process by the parts removal handling system at the end of each cycle. During the next production step, the standard aggregate (A) insertion-molds the housing around the individual optical parts. At the third rotary table station, a handling device simultaneously removes the finished parts. This is immediately followed by placing the metal contact pins into the cavities, which is accomplished by a high-precision robot arm during the cooling period, all within the 21-second production cycle. The Wittmann Battenfeld injection molding system is only part of a complex production cell. In addition to the injection molding machine, this production cell incorporates two more rotary cycle systems, in which the finished injection-molded parts are inspected (plug function, completeness and dimensions of the finished part). Next, the parts are deposited on transport trays. The connection between the injection molding machine and the peripheral equipment for quality inspection and packaging is handled by several Scara robots. Simultaneously, the metal contact pins for the connection plug are punched, bent precisely and prepared for transfer by the handling system, all done by equipment contained in the same production cell. All in all, a lot of technology to produce a high-precision sensor component. “But in spite of all this complexity, our daily production practice furnishes the proof that we were on the right track with our concept, which is largely based on Wittmann Battenfeld’s experience in nano and micro injection molding”, says Günter Benninger, Managing Director at Promotech, in his status report, to which he adds an explicit commendation of the fast, competent after-sales support provided by the Battenfeld service team for this equipment.